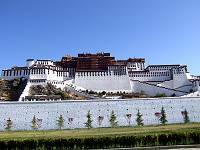 Like Angkor Wat in Cambodia & the Great Wall of China, it has been a my dream to visit the Potala Palace since childhood. The snow-topped mountains were visible from our window seat, a very different landscape from our other landings. The paperwork & luggage collection went through swiftly and our local representative was waiting to meet us. The weather was bright & sunny but the chill of the mountain air was noticable. We already had our sweaters on before leaving the aircraft. 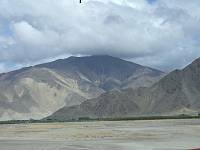 Breathing difficulties & a slight headache began to be felt as soon as we landed in Lhasa. This is a common effect due to the high altitude of 3650 metres. The advice is to drink more water & do things slowly. As our car drove out of the airport, my very first impression of Tibet was of a mountain desert. The view of yellow, sandy mountains were everywhere from our car window. The land is empty, forming a desert, almost like a moonscape. The journey from airport to the city centre of Lhasa takes about an hour. On the way we visited the Nietang Buddha. 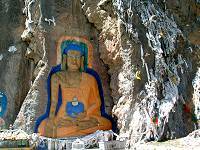 This roadside rock with large painted Buddha image inside gives some idea of the many monasteries to come later on. The usual white silk scarves & colourful flags decorate the temple. As we drove into the city centre the imposing Potala Palace came into view rising above the town. We checked in at the 3* Shangbala hotel. 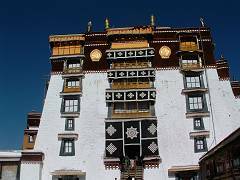 This is a superbly located hotel right at the doorstep of the Barkhor Square where the Jokhang temple, markets, shops & restaurants are full of activity. 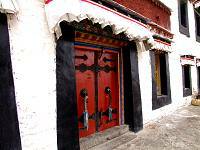 Like many hotels in Tibet, the Shangbala is a bit old fashioned dating back many years in décor & building. The lobby is decorated in local Chinese & Tibetan style, the rooms are simple & clean. There is a Chinese restaurant as well as a breakfast restaurant. Although there is a 4* hotel in Lhasa, it is not centrally loacted, and we have decided to use the Shangbala hotel for all categories of guest from now on. We started our first day tour by having lunch at a lovely Tibetan restaurant in the market square. 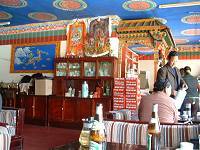 In the traditional Tibetan style the restaurant ceiling was covered by Tibetan materials decorated with colours & symbols. The Tibetan lanterns hang beautifully from the ceiling. We sat on the first floor by the window with a view of the market square & all the activities below: local women doing sewing & ironing on the street pavement, fruit vendors, material stalls and so on etc. The daily life of local people shopping & monks wandering around the temple nearby was unfolding in front of our eyes. After lunch we visited the Sera Monastery. Founded in 1419, it has about 600 monks in residence. The monastery is on a hillside with many steps to climb up to a white painted building with the traditional black door surround & window frames decorated with colorful drapes, like little theatre stages. This monastery is famous for the debating among the monks that takes place in the courtyard garden between 03:30 to 05:00pm every day. The sound of debating can be heard from a long way away - the debating is vigorous and noisy: the hundreds of monks dressed in red robes, sitting, standing & jumping on the white pebble ground among the tall green trees. It was an amazing sight. We circled round the big courtyard garden with our cameras watching all the activities of this unique scene. 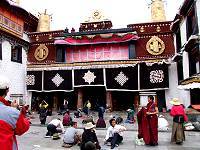 We returned to the market square, Barkhor, & visited the Jokhang Temple. This temple is the heart of Tibetan Buddism (more important really than the Potala Palace) right in the market square with many local people praying & chanting at the foot of the temple. The usual practice is first standing up with both hands together in prayer then kneeling on the ground or matt then lay flat down stretcbed out, these 3 movements repeated in succession repeatedly over and over. Some pilgrims perform this vigorous manouver on every step of their journey from their home to the temple. a journey that can take many months by this means. Many other worshippers walk round the temple clockwise, circulating around the whole perimeter of the temple many times, according to one’s age, whilst reciting prayers. On that day there was a special festival and many old people were spending the day together in prayer, sitting in a small open courtyard with their own prayer wheels turning & chanting. 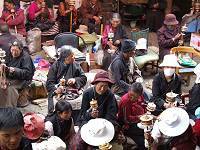 They had lunch & dinner prepared for them in the courtyard while they continued turning their prayer wheel from dawn to dust. The devotion of Tibetans to their religion is so pure. It is a very spiritual country. I was overwhelmed by the strength of their belief and honesty. Next morning we visited the famous Potala Palace. This was once the winter residence of the Dalai Lama & is now a museum and with over 1000 rooms it is the most imposing building in Lhasa. 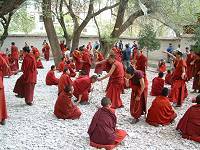 At the foot of the Potala Palace hill there is a stream of people chanting & circling the hill at prayer. Pilgrims to the palace also bring white silk scarves & yak butter (for burning in the candles) as offerings at the many chapels & shrines at the Palace. We began the uphill path from the entrance to the top of the world, the Potala Palace. 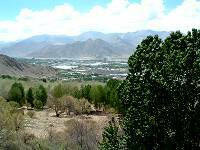 It takes about 10 to 15 minutes slowly walking uphill with lovely views of Lhasa town & its surrounding mountains. The palace with its white walls looks from a distance as if it is covered with snow. This huge building is made up of the white palace & the red palace, we entered the white palace from an impressive courtyard in front. The tall white building is decorated with golden roofs & black window frames & black and patterned door and window curtains We walked through the palace with admiration. We entered many rooms with previous Lamas shrines & Statues. Some are buried inside the Statue. The 5th Lama has the biggest statue because he was the most important Lama for a lot of work that he did for the people. The interior of each room is very dark with only the light from the burning yak butter. The holy palace is very quiet except the talking of the tour guide for different groups. They are asked to speak softly to their groups. After the Potala Palace we visited Drepung Monastery. 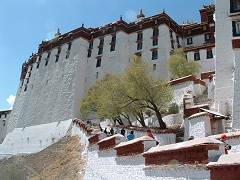 Although this monastery does not have the same imposing architecture as the Potala Palace it is located on the outskirts of the city on a hillside, so it provides a wonderful view of the landscape. This rural monastery is quiet with only few visitors. For lunch our local guide, Ten Zing, took us to another wonderful local Tibetan restaurant with colourful décor on ceiling & walls. We ate local dishes washed down with local Tibetan beer. 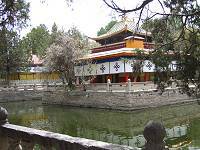 Afterwards, we visited Norbulingka Park, where the Summer Palace of the Dalai Lama is situated. This made for a very nice change walking in the parkland with the golden palaces, peaceful pavilions in the lake & gardens. There were a few visitors and some local people relaxing in the park. In the evening we were taken to a local restaurant for dinner & show. The food was a buffet dinner of Chinese & Tibetan dishes. The show was a very good performance of Tibetan songs & dances. It was a very genuine culture show. Next morning we left Lhasa & flew to Zhongdian, now re-named Shangri-La.